I would like to compile images of the various known antique XI swords that have plain disc pommels (Type G) to get an impression of how common they are. Looking in Records, one is given the impression that XI swords with various forms of Brazil nut pommels are by far the most common, with far fewer swords possessing Type G pommels, or other disc pommels for that matter. I'd like to see other examples that people know about. I'm not looking for XIa swords with Type G pommels- just ordinary XIs are fine. I can contribute a few examples... When I look at my own files, I can see about a 50/50 split between disc and brazil nut pommels, with type G the most common type of disc. The combination XI.G.1 is the most common specific type, and many of the swords are as similar as peas in a pod. Another British find, from the River Witham. Oakeshott's "miscellaneous #24". Unusually short blade. From Finland, full details can be found in Swords of the Viking Age. Was in the Legermuseum in Delft, but I think this collection was transferred and I forget where... Very long blade. A Gicelin sword from Hamburg, dimensions and proportions are identical to the the previous sword. There are two more XI.G's with Gicelin inscriptions: one in Copenhagen, and the other was found in the Netherlands. The latter has an unusual curved cross. In the Royal Armouries, IX.1027. Oakeshott classified this one as type Xa (it's Xa.5 in Records) but the overall appearance match the XI's so well, particularly the St. Omer sword... the fuller is really only marginally wider. It is worth noting that all of these examples bear an inscription of some kind (or the remains thereof). Not type G but here's a type I pommel, rounded cross of type 1 or 2, XI blade. I believe its also in 'Records' under miscellaneous. Does anyone know the weight of the St. Omer sword? I see Vikverir has a few photos of the St. Omer Type IX, so I've re-posted them here. Edit: The link that Guillaume posted for the St Omer sword has a particularly fine image of the sword, which I have attached to this post. There seems to be an unusually strong resemblance between these swords, as if they 'came from the same shop'. Do you think this one would fit with the rest? Here is a french page on the Saint-Omer sword. There's a few specs mentioned, unfortunately not the weight. I'll try to contact the museum to obtain the sword's weight. I think the only question is whether or not the Saint Galgano sword is best identified as a Type XI or Type Xa. In the photo you've provided Doug, it looks like it's unambiguously an XI. However, the photo I've attached shows the sword at an angle which makes the fuller seem a bit wider. To me, the fuller seems wider than those of the swords posted by Mark, perhaps with the exceptions of "Miscellaneous #24" and "IX.1027". The other detail that might be pertinent is the blade length. From quickly reviewing the myArmoury article on Type X.a swords, it seems many of them have blades that are between 32 to 34.5 inches in length, with blades of 35 inches being atypically long. If the blade were longer then it might be better classified as an XI. Sadly, we have no way of knowing how long the blade is. Nevertheless, the sword is close enough that I think it can be counted among the others in this group. I am surprised by how short the St. Omer sword is. Initially, I was wondering if this was to offset what seems to be an unusually wide blade, but then I noticed that Søborg D 8801 (XI.3 in Records) is actually a millimeter wider at 4.5 cm, and the latter has a longer blade and overall length, too. So it will be interesting to see how much it weighs. In fact I wrote "total length 96.5cm", but I'm not very sure about it... Looking at the proportions, it could rather be the blade length. In fact I verified on the sources, it is just mentioned "length". I hope that the museum will answer me to resolve this ambiguity. It is anyone's guess what the blade might have originally looked like, but I definitely agree that it is worth considering with the rest. Any distinction based only on the fuller width is at some point ultimately arbitrary, and the details that we can see are otherwise so consistent with the rest of the group. The blade seems like it was proportionally quite narrow overall, so type XI seems the best fit to my eye. I'm also wondering: how many of these swords date to the 12th century, and how many are older? 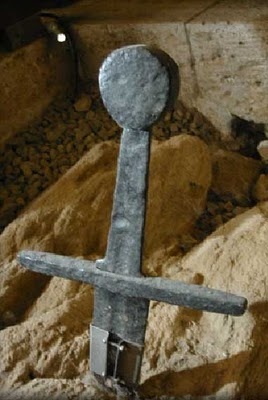 The first sword posted is dated to circa 1100 AD. The Saint Galgano sword seems to be mid twelfth century if we count it as part of the group, which seems appropriate. St. Omer gives their sword as dating circa 1180 to 1220 AD. Curiously, the Royal Armouries gives IX. 1027 as dating to 1200-1230 AD, although I would think that a date of 1180 to 1230 is also reasonable, especially because I associate Type H and I pommels as being more common to the early 13th century than Type G.
What of the other swords here? So I actually tried to draw it at scale, using the datas I knew, and it seems that 96,5cm is indeed the blade length. If not, the blade would be something like 82cm, which would be very short for a type XI - and the handle would have looked proportionnally far bigger. Incidentally, what a blade! If the point was originally acute, the blade must have lost like 1 to 1,5cm. But as I obtained with Peter Johnsson geometry and the global dimensions I determined with the pics, the blade seems good. Maybe the spatulate tip was on the original. The first sword posted is dated to circa 1100 AD. The Saint Galgano sword seems to be mid twelfth century if we count it as part of the group, which seems appropriate. St. Omer gives their sword as dating circa 1180 to 1220 AD. Curiously, the Royal Armouries gives IX. 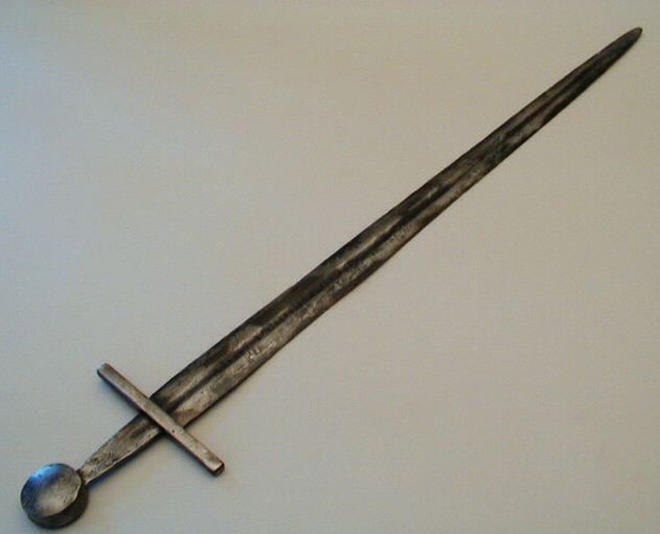 1027 as dating to 1200-1230 AD, although I would think that a date of 1180 to 1230 is also reasonably, especially because I associate Type H and I pommels as being more common to the early 13th century than Type G.
The swords from the Delft/Soesterberg and Hamburg museums have been ascribed to the 12th century and first half of the 11th century respectively in relatively recent catalogues. Seems like a very wide spread in dating considering these two are particularly similar in dimension and proportion... I suppose the dating of the latter is probably based mainly on it's Gicelin inscription. The museum's dating of IX.1027 seems like quite an outlier, and so specific...? Oakeshott's suggestion was for c. 1100 just like the first posted sword. Here is another interesting one for discussion... It seems very large in many dimensions, almost 115 cm long and clearly longer originally. There is a fragment of surviving scabbard, and a complex inscription that includes recognizable words: mater or pater, and filius. It also includes the sequence "TMAT" (et mater? ), which appears at the end of the inscription of the Soborg sword. The museum has it as 12th century. Does anyone know how IX 1027 would be classified by Geibig? That might help to clarify what portion of the 12th century it belongs to, including possible overlap into the 13th. I can provide an additional figure for the blade width at base. You’ll notice that Royal Armouries includes a ruler in the photo to give a sense of scale for the sword. I simply magnified the view a bit on my computer, then marked out the intervals between the centimeters at that magnification onto a sticky note. I then scrolled over to the base of the blade and used the sticky note as a ruler. From what I can see, IX 1027 is about 4.6 cm wide. Using the same method, the fuller looks to be 1.3 cm wide or so at the base. 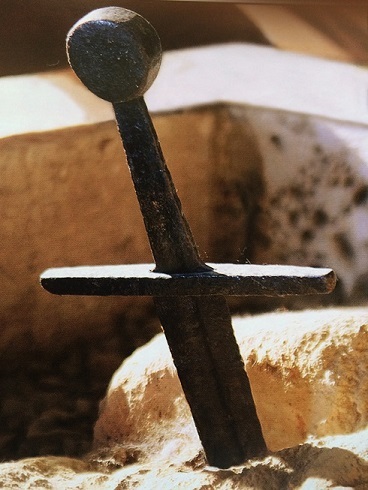 Marko Aleksić’s Mediaeval Swords from South Eastern Europe has a pair of swords, catalogue no.199 and 197 respectively, that he identifies as being Type Xa blades. However, assuming that his line drawings are accurate, the narrowness of the fullers means that both could just as easily be classified as Type XI blades. The sword on the right may actually have a Type H pommel rather than G, although the drawing seems slightly ambiguous. The blade to hilt ratio is not right I think, for this type(mostly the one on the right, but also the one on the left). XI blades are much longer when compared to the hilt. And I think it's a different story from the miscellaneous #24. Oakeshott indicates that a Type XI has a slender blade, "generally [emphasis mine] long in proportion to the hilt, with a very narrow fuller running to within a few inches of the point," (Records, p. 53). Notice that Oakeshott is not precise on the blade to hilt ratio, so this alone cannot be used to rule out a Type XI. I think there's a stronger argument to be made about the fullers not matching the description. That having been said, the narrowness of the fullers seems to be the crucial characteristic of an XI blade, and Oakeshott undoubtedly had not seen many of the swords in Aleksić’s book, which do not always perfectly coincide with Oakeshott's typology. So long as the fullers are truly as narrow as they appear, I think XI is an appropriate designation.